1 What is Temporal Arteritis? 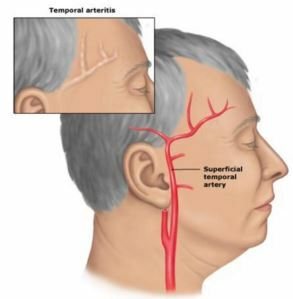 Temporal arteritis is vascular inflammatory damage occurs in arteries which supply the blood in brain. Affect of this condition is not limit in the brain, but extends in the higher part of the body which include neck, upper limbs, spine and eye. It is also termed as Giant cell arteritis. Complications associated with temporal artieritis are neurological disorder and vision impairment as optic nerve is affected. It is progressed with increase of age, reported case studies provided evidence that onset of disease main occurs after 60 years of age. Evidence showed that inflammatory damage of temporal blood vessels often affect other major blood vessels which include carotid, subclavian, and iliac arteries. Early diagnosis and medical assistance can reduce the chances of progression of the complications. The reported case for female is four times greater than the male. Brain is a complex structure which composed of different tiny segments and every segment has some specific action for regulate our whole physiology. In temporal arteritis, part of the brain is not getting sufficient amount of blood supply and different symptoms are arises. The enlisted symptoms may be similar with other ailments and vary with affected part and extension of damage. Back or side of the skull become inflamed and headache with throbbing sensation is common. Mandible and maxilla joint pain during mastication (chew). Sudden onset of vision disturbances which include blurred vision, reduced vision or double vision. Blood vessels become swelled up in temporal arteritis. In temporal arteritis, blood vessels lose its elasticity and unable to circulate the blood. Arteries carry oxygenated blood and supply to different parts of the body. In temporal arteritis, medium or large sized arteries present in the temporal lobe become inflamed and stiff. The outcome of this, restrict the flow of blood to the brain. Due to lack of blood supply the different cranial nerves present in the temporal lobe become impaired and associated complications arise. The symptoms associated with temporal arteritis are very similar to other disease conditions; clinicians need to do a thorough diagnosis to conclude the disorder. The detailing of each symptom and medical history analysis is important. Physical touching on the scalp helps to identify the presence of tenderness at the back or top of the head and string like feel is generated with throbbing sensation. After physical examination, if the doctor suspects temporal arteritis, then usual recommendation is to conduct the blood test. The enlisted blood tests are an estimation of the erythrocyte sedimentation rate (ESR) and C-reactive protein (CRP). Higher value of ESR indicates presence of inflammation in the body. C-reactive protein (CRP) is synthesized in liver during inflammatory reaction taken place inside the body. Both these tests are also conducted during the treatment phase, to check the improvement of the condition. The biopsy of the part of inflamed temporal artery is a standard diagnostic tool for temporal arteritis. For cross checking purpose doctors may recommend repetition of the biopsy test. Usually the test is similar with MRI, but contrast medium is added to obtain exhaustive images of the temporal arteries. By using sound waves, create images for blood circulation in the temporal arteries. Intravenous administration of trace amount of radioactive materials and conduction of PET scan can generate comprehensive images of blood vessels and locate the site of inflammation. Different potential complexity is associated with temporal arteritis, which includes blindness, stroke etc. for prevention of these complications, early onset of treatment is very important. Sometimes, depending upon the suspicion of the presence of temporal arteritis doctors prescribed the medication, as diagnosis test conduction is time consuming which may delay the treatment onset. The latter depending upon the test result, they modify the prescription. 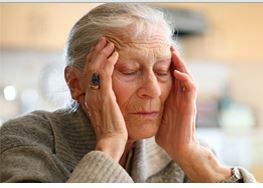 The first line drug of choice for the treatment of temporal arteritis is steroidal drugs which include cotricosteroides, hydrocortisone, and prednisone. Long term treatment with steroids often causes osteoporosis. For preventive measures the additional medicine such as vitamin D supplement, calcium supplements are added in prescription. Other than these, doctor advice to do some weight-bearing exercise and quit smoking. Aspirin is also prescribed for liquefy blood and maintenance of flow of the blood, which prevents stroke and blindness.